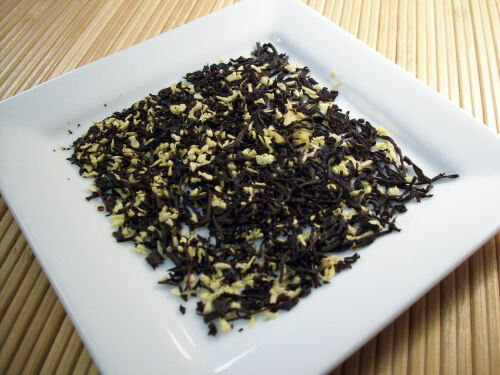 An excellent black tea with coconut, almond and vanilla flavoring. A Christmas favorite. Great with sugar and cream! YUM! This tea is really tasty! The black tea base is strong yet smooth. There is a hint of bitterness toward the back end of the sip, but it isn’t an off-putting bitter taste. I think that this faint bitter note may just enhance the overall experience with this tea – giving it some interest and cuts through some of the sweeter notes of the tea. While the coconut and vanilla are the most prominent in the aroma of the liquor, it is the almond that is the first flavor I detect. As the nutty flavor washes over my palate, it melds into a sweeter flavor … coconut! The vanilla hits the palate at the end with its creamy, sweet presence. Together, these three elements – coconut, almond and vanilla – along with the black tea base creates a delicious, decadent tea that would make a lovely dessert tea (perhaps with a tray of cookies?) but would also be quite good served at breakfast time with a little milk and honey. I drank my cup without milk and just a drizzle of agave nectar and it was rich and scrumptious. I did taste the tea before adding the sweetener, and it does have a nice sweetness without the agave – but I like how the sweetener brought out some of the flavors. The more I sip this tea, the more I like it. It’s really good!